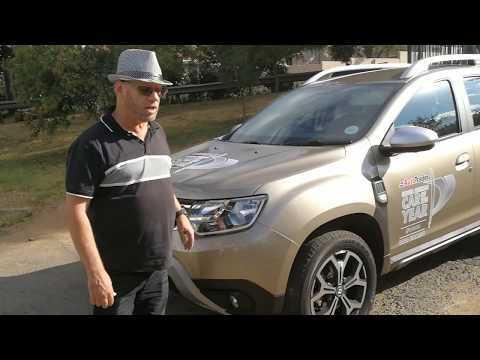 The Duster has been a success story for Renault SA since its launch a few years ago. Deliberately rough and tough and built for our roads, whether urban with potholes or some mild off-roading even in the 2 wheel drive versions. Another plus has been that the Duster was priced against some somewhat smaller competitors even if they were a bit more refined. Enter the new Duster launched late in 2018. With a few exterior changes aimed at modernising the face such as changes to headlights and Daytime Running Lights. Then the tail lights with a very distinctive X pattern (that does somewhat remind you of Jeep). However, most of the changes are on the inside. No matter how cost conscious SA buyers may be, they still demand comfort and refinement. Renault have heard this call. The interior has been thoroughly updated and the general feel is more modern and a little softer than the hard edges of the previous model. One area that really still deserves change is the continued use of the old-style "Key Card". This is extremely clumsy compared to the modern style fobs used by most competitors now. In addition, the very small buttons on the card are very difficult to use at night. A criticism that I, and many others, leveled at the old version was the low placement of the infotainment screen below the air-con controls in the centre stack. Now, it takes its rightful place above where it is far more in the line of sight of the driver. There were more changes made to rear suspension that have resulted in a far better, and safer ride both on tar and dirt roads. This has also resulted in an even larger boot of around 460L. The test car was powered by the proven 1.5L 4 cylinder turbo-diesel that has been used by the Renault/ Nissan alliance for many years. It may be getting old, but I still rate it among the very best small diesels around. With figures of 80kW and 250Nm, there is never a lack of adequate power or response. Of course, as previously, this engine proved unbelievable in the fuel economy stakes. A full week of driving under all conditions returned an on-board computer figure of only 5.4L / 100km. The 6 speed EDC dual clutch automatic gearbox performed faultlessly as always. There have been occasional criticisms of this transmission when used in performance versions of Renault cars, but in this application and in "normal"usage it proved ideal and comfortable. Overall, Renault have taken a highly successful package and updated and improved on the recipe. 4x4 versions have just been added to the range for improved dirt road or off-road ability but with manual transmission only. The Prestige is priced at R340 900 (there is a mechanically identical Dynamique version with lower spec available at R322 900). A 3 year / 45 000km service plan is standard.